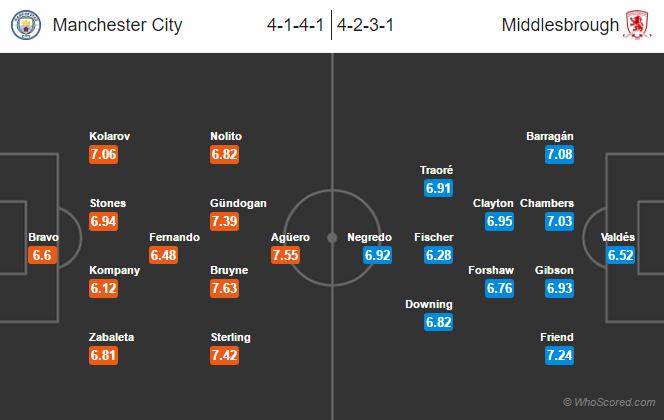 Premier League match preview Manchester City vs Middlesbrough, game week 11. Important things to know; Kick-off. Referee: Kevin Friend, Stream Guide: Watch Live. The home side are coming from a great victory against Barcelona in Champions League. Boss Pep Guardiola could be brining a minor change in the squad. Claudio Bravo who missed the game due to suspension is back. Fernandinho has joined Fabian Delph and Bacary Sagna on the sidelines. Vincent Kompany who was on the bench against Barca is expected to return to the lineup. The visitors will be without Gaston Ramirez who is suspended for this game after picking up his fifth yellow card of the season. James Husband, Daniel Ayala, Marten de Roon and Cristhian Stuani are all doubtful through injuries. Manager Aitor Karanka is expected to start with the similar lineup as of last weekend. Manchester City are unbeaten in their last eight home games in Premier League. Middlesbrough have won three of their last six games against Man City. Middlesbrough have kept clean sheet in their last two league games. Manchester City have kept one clean sheet in their last five league games. Manchester City 2 – 2 Middlesbrough, the visitors are likely to surprise the home side with an amazing display of football.